My last few posts had a sort of boxing theme woven in. Not sure why as I never really watch boxing. But for the first time publicly I will admit I occasionally watch C-Span. I'll risk the damage to my reputation and street cred to share something with all the subterranean readers. C-span is a channel I usually only peruse when really really bored or on the way to another channel. Once in awhile I actually plan ahead and tune in to something on C-Span. Such was the case a few days back when I watched a program called After Words where Diane Ravitch interviewed Steven Brill on all things education. The bout, I mean show, lived up to my expectations. I agree completely with almost no one in this deceitful world of ours but I'd sit on Ravitch's side of the church in a wedding for sure. I'm just sad we rely on a 74 year old to carry the flag and she's pretty much the only one that makes a convincing case on behalf of common sense. Buckle up and make some popcorn before you sit down to watch. This is a tense, informative, frustrating and entertaining look at what amounts to a debate reflecting the polemical nature of education reform. Sure I'm personally a little frustrated with all the data, abstract talk and absence of real teachers in the conversation but still I highly recommend you spend a few minutes(or even the whole hour) watching. Click link below to watch the program. This interview has it all: Diane Ravitch, Steven Brill, Joel Klein, No Child Left Behind, Race to the Top, Charter Schools, The Death and Life of the Great American School System, Class Warfare: Inside the Fight to Fix America's Schools, Teacher Unions, Pay for Performance, Merit Pay, Value Added, Democrats for Education Reform, you name it. Love to hear some reaction and then I'll maybe share some of my own. Three down, one hundred seventy-seven to go. But who's counting? 1) Mold- We've had several visits from the folks at building services this week. After Mr. Lindsay reported mold growing on his desks and I found a little on mine they've been keeping tabs on our climate. I don't know what it means, but sixty percent humidity and seventy-nine degrees doesn't sound like the ideal for a classroom. Perhaps we could invite our science classes down for a little hands-on learning. 2) Administrators- They started Monday morning by cutting our "nuts-and-bolts" sessions from forty-five minutes to one-half hour each. Thanks, it made for a nice start to the week and a little extra time in the class. I guess I don't need to forward "What Teachers Want From Administrators" to any of our principals. 3) Earthquake- I'm glad we didn't have students yet. The earthquake was a reminder of how fragile our world can be. Our principals had to admit to students and staff today that we really don't know exactly what to do with an earthquake. There isn't a policy, procedure or drill. Sometimes life just doesn't work with a manual and hopefully the halls of education are a place where we can learn how to function in an ever changing world. 4) Wednesday- Some people find it silly to start school in the middle of the week. After feeling the exhaustion of the first day of school, the three-day week to start sounds like the best idea ever to me. I forget every summer how tiring teaching can be, and a short week to ease back in is just perfect. 5) Students- That's why we do this. The fresh new faces that greet us each fall. Full of potential and eager to know what your class is going to be like. Whatever problems and stresses the profession of teaching brings, from bell to bell is what we live for. We ended week one at the football game tonight. We've spent three days with these kids, they've learned what to expect from us. Tonight we were able to say hello, and watch them interact in a setting more natural than a (moldy) classroom. On Monday, we'll ask them about their weekends. They'll tell us about their lives. And together we'll experience all the ups-and-downs that the next one hundred and seventy-seven days will bring our way. But who's counting, we'll look back on it in June and wonder how the year flew by quickly. By all accounts, central Virginia experienced 6.0 magnitude earthquake just minutes ago. We sat here, on the day before school, making final preparations for school tomorrow when suddenly, the whole earth started shaking. If you haven't figured out from the title of the blog, we literally teach underground. We are two of six classrooms in the basement of our school. We've grown used to an inordinate amount of movement and noise created in the basement from the World Language classes above, but it was quickly apparent that this time it was different. We exited to the breezeway of our building and after failing to find reassurance in the eyes of our fellow teachers, all eyes directed toward the sky. Our 1980's upbringing took our minds to the possibility of a nuclear bomb. The clear skies brought a reassurance that dismissed the scenes ingrained in our minds from a Cold War childhood. Even after the earth stopped shaking, the metal handrail of the stairwell continued to vibrate, leaving little doubt that we'd just experienced an Earthquake. Several co-workers had their children with them, obviously scared. I was scared. This will easily rate in the top three scary moments I've experienced in ten years of teaching. The event is still fresh and we are all looking for details. Still, we hope and pray that no one was hurt. I estimate that we are at least forty miles from the epicenter. I can only imagine if a 6.0 earthquake forty miles away shook Charlottesville, Virginia this hard how traumatic the experience of Haiti and other severe earthquakes of recent years. We are thankful that we're safe, but we never expected the school year to start off like this. 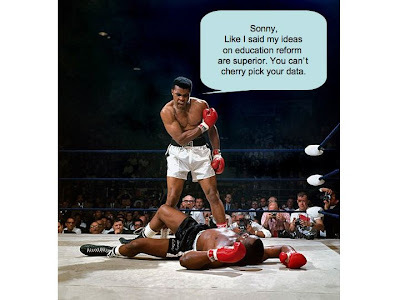 My colleague in one of his latest posts gave some perspective on the idiocy of NCLB. We are back at work this week diligently attending meetings out the wazoo. In many of these conversations, talk turns to moving beyond the SOLs. On Orientation night I ran into a parent of one of my kids from 1st semester and she mentioned her child's result on said SOL and I felt like the butler in this video. Like most teachers I wanted to be Rocky Balboa at the end of a fight and raise my hands in the air with my students and claim victory. No such luck. The truth is that moving beyond something as ginormous as the SOLs will be tough for many reasons. In a post earlier this year I shared my state of mind when I got the SOL results. These determine whether or not our school makes AYP(we did not), how I am measured, and many other things. After 2nd semester's results came in I wasn't so much confused as I was frustrated and angry. SOLs have made me like Rocky in the later movies, my brain turning to mush from constant pounding. The punches coming from all this SOL/AYP talk. I just can't get this whole SOL conversation out of my head. It has become all consuming. Not because I focus only on SOL content or whether the school or division is making AYP. It's because like many teachers I think about the impact on individual kids. Too often when I see a parent or kid the test comes up. And it should. 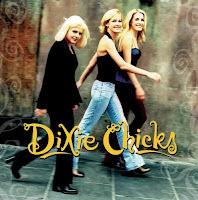 People should be outraged...protesting...calling for firings(not mine please)...or at the very least not buying Dixie Chick Albums. What do these scores and test results mean? In other words..."what is the truth behind the SOL?" I'll avoid the school or division wide discussion here. This Spring's results got my dander up(whatever that means) so with some colleagues we expended some effort back in June trying to find out what the truth was about how we really did. As we peeled back the layers of the testing onion it got pretty stinky at times. I thought sharing some of what we learned might illicit a degree of empathy from the non-teachers among you that went to school before we migrated to this other-worldish test driven planet. After all we teachers can't be malcontents all of the time and need some help. At first glance the numbers appeared to show me 2 things about my kids. 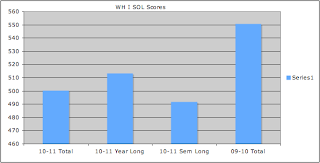 No surprises passing wise...but there was an pronounced drop in Pass Advanced(scores over 500). So I started to ask what exactly the difference was in how scores were labeled (Pass Advanced/Pass Proficient) and then how exactly the test scores were calculated(not that I hadn't asked this before mind you). What I found, or didn't find was troubling. The labels applied to results seem to have little to no value as an educational tool. But I'm getting ahead of myself. Back to my conversation with the parent where I shared that my own feelings on SOLs are pretty complex. I can only imagine the feelings and confusion involved for parents and kids. Testing generates one powerful thing. Data data data...I spent more time this year looking at my numbers than I did in the previous 10 combined. To be fair it could be said I was not looking at data this time but instead trying to find the answers I wanted. When those in the higher ranks of education policy engage in this practice I am highly critical. I tried to share with the parent a combination of brief history of SOLs and some analysis at the same time and somewhere communicate something resembling the truth. This included the fact that these numbers have to be interpreted and despite claims to the contrary, numbers can lie. 400 is passing proficient, 500 is pass advance, 600 is a perfect score. Tests and questions in Social Studies EOC tests are not released. The state adopts a cut score and this is a criterion referenced test(I am not sure those statements are compatible). No one other than the people who make and grade the tests seem to fully understand everything about these tests and that seems to be the way they like it. The amazing lack of transparency is troubling. So as I explored my results I was bothered by the logic of a grading system where one kid answers 35 correct and gets a 417, another student in the same class who gets a 415 but got 36 correct(different test versions). The company (Pearson) points this possibility out but again my brain is mush so I don't get it. So mush and all let's look at a random student who got a 492 and received a Pass Proficient rating. What does that mean? Not that much honestly from what I could tell. On the World History I test there are 6 categories and a score of 50 means the students answered all of the questions in that category correctly. The amount of questions in each category varies by the weight of the category. 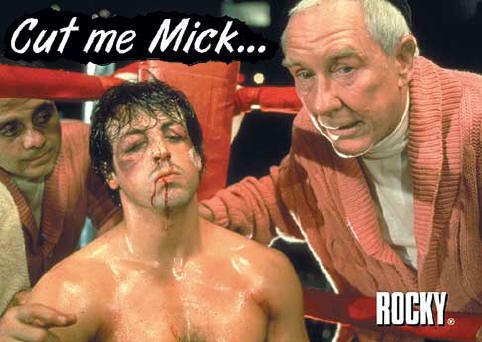 Usually the reports we get from Pearson are about as clear as Rocky's vision when he uttered the phrase "cut me Mick." We get an overall number and some scores in the six separate categories. My favorite part is this section of the report that reads... "Reporting category scores, which are on a scale of 0-50, can be used to identify students' strengths and weaknesses. A score of 30 or above indicates a strength. A score of less than 30 indicates that the student may benefit from additional instruction in this area". So this particular student was judged as "strong" in each area but only received a Pass Proficient. So why not Pass Advanced? We asked the same thing when we saw the drop in scores and what kids got what scores. Here is what I found and it honestly came a little late to comfort me or any of my kids when they were judged as only "Proficient". As for what that means here is a link to the VDOE summary of performance level descriptors for each grade and end of course test(note the absence of Social Studies descriptions). These labels are supposed to assist parents, students and teachers in understanding how they did. But few understand what the labels actually mean or how they are determined. AYP for our school only factors in pass rates and is unaffected by these terms. But kids are and some took it pretty hard. Use of these without proper context would be as dangerous as a kid running with scissors and likely invalid when used to measure how we are doing. Is the same true for individuals? Some of my kids and parents were disappointed especially those who got a Pass Proficient. My disappointment stemmed from the drop in Pass Advanced scores and seeing the reaction of kids who have grown up with these tests and sadly measure themselves by how they do. These pie charts graphically illustrate the data from my honors classes only. What a difference a year makes! Before you call for my firing or resignation spend a second thinking about some of the stuff we've written about on this blog that affected our results. Adding an additional class to teachers and student workloads and switching to the 4x4...guess what. Looks like it made a difference. But so did the test. The graph above shows the difference in 4x4, A/B and totals the last 2 years. Ouch is all I said. To an outsider it would be evidence we weren't doing as good of a job. But that is misleading to say the least. On the 4x4 we had to go fast and that meant cut some things out. The obvious choice is material that is not going to be assessed and that is a shame. I still felt I gave them a solid class that was rich and varied enough to feel they were prepared to do well. The test was made "more rigorous" which I welcome but it is apparent the test makers view of what to stress is different from the people who actually teach kids. (I 'll have to thank the State Super for the heads up on these shifts next time I see her) I had some really smart kids who knew their stuff and was as surprised as them when they didn't get a Pass Advanced. Nothing I have found gives any meaning to the terms Pass Advanced/Pass Proficient in social studies and I have looked everywhere. But that is the first thing parents see that has any meaning to them. The difference is simply it says one is a 400(31 right) and one is a 500(53 right). We spent some time figuring out the exact scale(neither the state nor Pearson gave us this...maybe because they don't want people to know that kids only need to get 1/2 of the questions to pass). 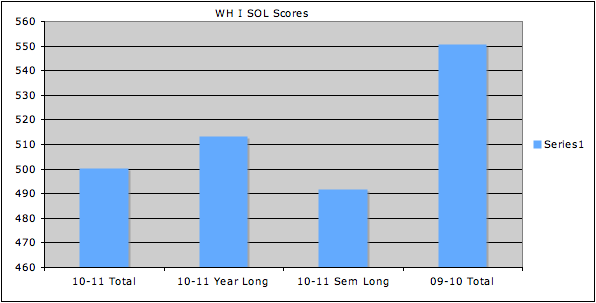 If they used the scale from previous years the drop in my kids scores would not have been as dramatic. The tough part is many kids define their performance by these terms but don't even know what they mean. They might know(most do not) they can miss 29 questions and pass but incorrectly assume that the break from 400 to 500 is halfway to a perfect score. It is not. So the truth appears to be these labels and numbers have little substantive meaning. They just fall in from where they set the cut score for 400 and exist in a vacuum until they are pulled out by a bean counter somewhere or by parents who are unable to put these in proper perspective. So I hear frustration and confusion when results come up. Well what do you want for a couple million...? Since "they" have yet to release more than 1 test in social studies(I have yet to see a test or question still being used beyond the things like the sparse examples found here)) and also do not provide specific feedback, I can't really tell what kids knew and what they didn't. Consequently I have no way of doing a better job preparing my 2nd semester kids by using results from 1st semester and no way to improve next year. This is the type of thing that says to me the SOLs and a great deal are not really for the benefit of the teachers or kids. This quote seemed fitting on so many levels of the testing approach in my state: "Is there anything that we are doggedly pursuing without regard to the actual impact it is having on our intended audience? If it only makes sense to us, it may not be making sense at all." Staying with the theme of not making sense, the kid's detailed report reads something like this: "Question Description: Describe an essential belief of a major religion.---- Incorrect." So I can tell they missed a question about religion but not which religion or what specifically they didn't know. Was it Islam or Christianity? The founder or how they worship? Imagine one about civilization,...but was it Greece, Rome, Japan Inca...who knows? Throw in the silly graphics, poorly worded questions and inferences required and the misses start to add up. Pretty useless honestly other than just assigning a score and determining minimal competence for AYPs sake. So here's the truth, truth... I think SOLs do more harm than good and I hate them. I hate people who promote their use and do so from a position far from their impact. I hate the fact people point to kids scores but not kids accomplishments. I hate I am being asked to move beyond the SOLs but still have to deal with issues like this. I hate how they are adding a "college ready" designation in some subjects...think for a second about the impact that'll have on kids who don't meet that mark. I hate that the term "failing schools" has gained footing and is commonly used but like an SOL score it carries little concrete meaning unless you fully understand it. As for measuring the kids performance, I'll stick to my more holistic measure...I call it a grade. Hope some of this "truth" made sense and you didn't get too punchy towards the end. Last year I had 132 students. I was shocked when I had to fail 128 of them after they took their final examination. Only four of my students were good enough according to the standards that I set for my class, so I had not other choice than to fail all of the rest. I hope they learn a lesson and do better this year. Some of them are very bright, they just didn't master all of the material of the course. Some of them struggle at home and I know they don't have the best support. Most of them would surprise you. You'd never guess they were failures by talking to them. They are articulate and hardworking. I bet they could even succeed in college. Too bad they can't meet the standards of my class. Does this frustrate you? I find it frustrating. If this scenario were true, there are only two possible interpretations. 1) I am a terrible teacher and need to be removed from the classroom; or 2) The standards and assessments are unreasonable and need to be adjusted. It is that simple. I am either expecting too much or I'm not adequately preparing my students to meet appropriate standards. The state of Virginia recently released Annual Yearly Progress data for each of its 132 divisions. Only four divisions met AYP. Across the state last week, cities and counties watched their local news to hear about more failure from our public school systems. Politicians and educrats continue to make a mockery of the institution of public education. The only rational reaction to a figure like this (128/132) is to abolish the horrible failure that is public education or get real and admit that our metrics for measuring student, teacher, and school effectiveness are inadequate. Responding to the media, Albemarle County Public Schools spokesperson Maury Brown said, "we don't think that the worth of a single child or teacher or school system should be measured by a standardized test." Assistant Superintendent Billy Haun said, "we know as a division where we are. I can’t help how the state has chosen to look at success.” As a division, the county achieved 91% pass rates in Reading and Math. 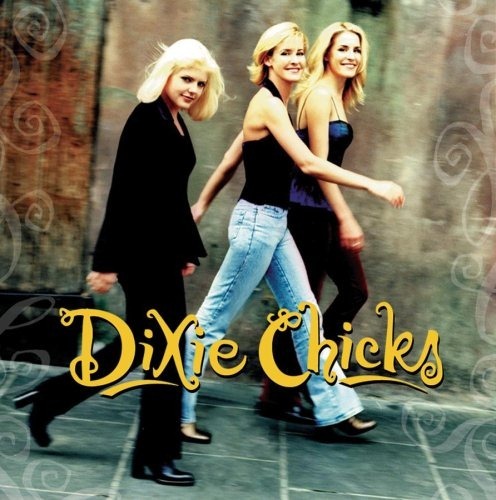 Yet for 2010-2011, Albemarle County has failed. We can't have it both ways, the numbers are meaningless or they're not. As long as administrators hold pass rates up to their teachers and make judgments on teacher effectiveness at the school level it's hard to defend that our divisions shouldn't face consequences from the state and federal government when pass rates don't meet expectations. Individual educators and divisions alike could benefit greatly if testing data could inform decision-making, but data has become the point of education. Looking back in frustration and ahead with hope, the second part of the quote from Billy Haun might be the most important part of the story. Can we help how the state (and even the federal government) has chosen to look at success? I don't know the answer to that question, but I believe that we need to try. Otherwise we're just spinning our tops and playing games with the students who depend on us. If these metrics are accurate it's time to stop playing safe and abolish this public education and start all over again. If they're not, then let's stop pretending and start acknowledging the quality work produced by principals, teachers, and students every day. We may not believe that that the worth of a single child or teacher or school system should be measured by a standardized test, but how do we uphold that belief with action? Maybe I'm presumptuous to imply in this title that I speak for all teachers. Let me know if you agree. As many teachers prepare to greet their students on the first day of school, and others enter their buildings for the first time since last spring I would like to offer this open letter of sorts to all of our administrators explaining what we would like from you this year. If any administrators out there are reading, we'd be glad to have your input on this list, and perhaps even your wishlist for teachers. 1) Give us time to work. Professional development and school improvement meetings are important, but when teachers are preparing for a new school year our primary concern is quite immediate and practical: "When students walk into my room for the first time, will I be ready to engage them?" Until this basic teacher need is met, nothing else matters. It's like a hungry child sitting in a classroom. He/she isn't going to learn a thing as long as the focus is an empty belly. The best professional development in the world won't mean a thing to teachers who don't even feel prepared to face the first day. 2) Focus on your immediate responsibility. My primary responsibility is the classroom. If writing for Teaching Underground interferes with that responsibility I should either quit writing and focus on my teaching, or quit teaching and become a professional writer. I don't care how badly you want to become the head principal, superintendent, or something bigger, don't neglect your job for it. The classroom is my responsibility. If your responsibility is a department, a building, or a division, don't short-change it by focusing on your long-term career goals. 3) If you don't agree with it, say so, and do something about it. I do what is best for my classroom. That involves compromise, and sometimes doing things that I am told just because I am told, but not speaking up is professionally irresponsible. Whether you're dealing with teachers who are out of line, or district level administrators that you disagree with-- do something about it. 4) Tell me what you expect from me. We (teachers) like you (administrators). We couldn't do the job we love without your support. We understand that your job is hard. So is ours. Let us know how we can work together to best serve our students. 5) Treat us at least as well as you expect students to be treated. If you've ever been frustrated because Mr. X just stands in front of his class every day and lectures and you have to deal with referrals every day because students can't help but misbehave...then don't wonder why we're so disengaged when someone stands in front of us and reads from a powerpoint calling it professional development. 6) Protect our time and ability to educate. I know that teachers bear responsibility for this, but unless we change job title, instructors instruct, administrators administrate. You get paid more than us. There is a reason for that. Let us know how to help with supervision, school operations, and discipline, but don't put the primary responsibility on us. I have enjoyed many excellent administrators that have helped shape who I am today. I have also endured many administrators who have made little difference in my professional life other than to make it more difficult. My very first principal told me after my first observation, "I won't lie. You're not the best teacher I've ever seen, but we can work on that. I'm ok with what I saw yesterday, but if I come back in two months and things are still the same we might have some problems." He took the time to know me and my classroom well enough to honestly make that comment. He spoke the truth and offered encouragement. Fifteen years later I still appreciate the wisdom shared by that principal. I recognize every year that I'm still not the best teacher, but I can work on it. If I reflect on what I'm doing and two months from now things aren't any better, there's a problem. His words in my first official evaluation have provided a context for continual self-evaluation and improvement that lead me into my sixteenth year of teaching. Teachers make a difference, but so do the administrators. Best wishes for a great new school year. And let us know what we can do for you. I sat in a doctor's office recently and overheard a couple sitting nearby in conversation(bad manners I know but you pick up this skill being a teacher). The gentleman reading the paper commented something to the effect "these kids aren't being taught anything about this nation anymore...we are in trouble." I bit my tongue and resisted the temptation to counter his claim with mountains of data that I carry with me on a notecard(not really). When he was called back I picked up the paper he was reading and found the editorial he mentioned. Walter Williams' Op Ed was an indictment of many people on many levels and I started to understand why this fella said what he did. Liberty 101 references the NAEP(National Assessment of Educational Progress). See how you do on the 4th grade civics questions. or the 12th grade ones. How'd it go? Well from what Williams presents it might seem all the kids in this nation are dummies. But it is Williams who fails in some respect when he carefully selects information to support his points. His opinion piece borders on misinformation and he shamefully tempts the reader to the same conclusions using slight of hand. Referencing some college professor from Stanford who uses unnamed sources then tossing in some unnamed "surveys" to prove we aren't doing a good job teaching our kids. The answers are bad but they are hanging there with absolutely no context. Maybe I'm on the lookout for criticism but this can't all be chalked up to what schools aren't teaching as the gentlemen in the waiting room insinuated. Nevermind the role parents must play in educating their kids about the fundamentals of our history and government. Williams is an accomplished and distinguished professional. 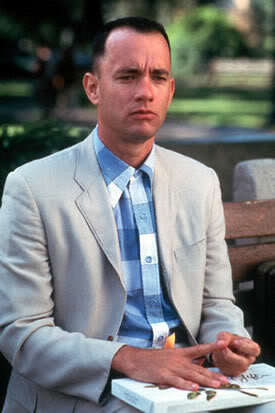 When I read his work and that of other keenly intellectual people I quickly feel like Forrest Gump. But that does not mean Forrest Gump or myself are ignorant. I disagree with the conclusions he draws here and think this lack of balanced thinking on education is way too common, and not just in opinion pieces. It is a subject where each and every person basically has an opinion and qualifies at some level as an "expert". He loses me when he writes in part "The ignorance about our country is staggering. 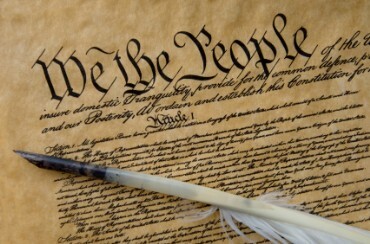 According to one survey, only 28 percent of students could identify the Constitution as the supreme law of the land. Only 26 percent of students knew that the first 10 amendments to the Constitution are called the Bill of Rights. Fewer than one-quarter of students knew that George Washington was the first president of the United States." Sounds bad right? But is it really that bad? Pay attention because all that bad news is not from the NAEP, it's from some survey. If you don't have a life you can check out the ACTUAL RESULTS HERE from the NAEP. I didn't need to look them up cause they are on my notecard. For those that actually understood those results I should point out that notecard thing is a joke. Those charts and graphs didn't make much sense to me other than it appears there have been minimal changes in the last 12 years. My measure of what kids know comes from time spent getting to know them in the classroom. But seems like in today's world you can't convince someone of something unless you back it up with some sort of data. Data trumps good old fashioned common sense. So here's some anecdotal data(I really like that phrase). Earlier in my career I had the chance to teach a few honors sections and before we met the kids a group of us gathered in the summer to read some essays they wrote the previous year. They were some of the worst things I ever read! I literally thought, "wow these kids are all dense.". That year as I got to know those individuals I realized they were some of the most brilliant kids I have ever met. Harvard, MIT, Rice, UVA, William and Mary among the top notch schools from which they have since graduated. But not all went to college or hold steady high paying jobs. The numbers collected from them don't tell their whole story as people. So going back I suspect that since this thing they wrote wasn't the all-important NAEP and didn't matter to them they didn't give much effort. Interesting to note that one change I have observed over the past decade is that the tests have become what is important to these kids. Their value as individuals is measured not by what they learn or know but by what they score. Kids have a funny way of stepping up when something is important to them. I think we need to make sure to stress the right things. Sure ignorance is out there and schools combat it every day but older generations are never satisfied with the knowledge of the next. There are things every American should know and appreciate. There are roughly 50 million kids in our schools and a lot of them know what they should. Some of those kids don't and too many schools and kids are in trouble. DC, near where Williams works, makes the news a lot but there are some 75,000 kids in DC public schools total. Assessments and ideas based on experience there might not reflect the greater whole beyond the beltway. So yes, kids are kids and often by their very nature are ignorant of things we as adults just know. But sit down and talk to them for spell before calling 76% of them ignorant. The piece descends towards the end and concludes Barack Obama's election is evidence of the "contempt for American values, civics and history". He and the other supposed "Marxists" he brought in. The only thing missing there was the call for the birth certificate. So Williams throws stones at the brainwashing educational establishment, the President, the media, the educational elite(obviously a group I know nothing about), High-School kids...did I miss anyone? Attacks aside I'll give Williams benefit of the doubt and assume he is asking for a return to pride and appreciation for our nation and the ideas it is predicated on. I think that sentiment might also be valuable if applied towards our schools. A little pride and support aimed at our schools right now would go a long way. I do sometimes ponder how curriculum requires me to teach my kids more about how people survived in Asia, Africa and Europe than in Early America or where we actually live. But I do teach primarily Ancient World History. In no way in my efforts to destroy ignorance towards the rest of the world do I de-emphasize the importance of this great nation. Quite the contrary. To jump this far suggests a serious lack of judgment. To learn about the world might somehow fuel fears of Williams' and others who perhaps see globalization as the end of American sovereignty and influence. If I was writing this article I might lean towards a greater focus on the economic factors influencing this and the role of multinational corporations. Easy for me to say as this has taken a dramatic toll on many in our nation as jobs and business have globalized their way over to where people are paid far less in an effort to reduce cost. Is this the fault of the schools? Too many including Williams(an economics professor) have narrowed the role of schools as a mere vehicle to train future employees and empower them with the necessary skills to operate in the world and keep our country strong. To me the highly centralized system that we are moving towards where a shrinking number of people control policy has echoes of the old Soviet system. If all we do is continue to toss out facts and figures out about how bad we are doing and how ignorant our kids are...we are in trouble. So maybe that man in the doctor's office was actually the one who was ignorant, not the kids. He fell victim to Williams' dimly lit view of our kids, our teachers and a more balanced view of what is really going on. I see people every day who suffer from a lack of knowledge, education and awareness. We must remember we can only battle ignorance by avoiding ignorance ourselves. Among the things I enjoy most are spending time with my family, teaching and fishing. The only one that allows me much time for reflection is fishing. I was on the James River recently with my fishing mentor and guide. A rugged sort of man and his steely eyes rarely break from the waters surface as the river slowly carves its way between the rounded knobs that direct its path to the Ocean. He's probably forgotten more about fishing then I'll ever know. Our trips take an entire day and can be grueling if you are not ready for them. You have to rise before the sun, endure the triple digit heat, make 4-5 casts a minute for 11 hours, and sometimes dodge horrific thunderstorms to stay alive. But rowing down the river that helped spawn America trying to catch something that doesn't want to be caught is a place I really enjoy being. We take our fishing for Smallmouth Bass pretty seriously. He talks very little while guiding but when he does he's either yelling at me like an old school coach for letting a fish escape or sharing insights only gained from countless hours spent fishing. He's taught me a lot about the river, the land and life. On a recent blazing June day he was working hard trying to put me on some fish and his efforts granted me an opportunity to reflect as I scanned the river picking my spots. I thought a lot about the past year teaching, how tough it was and how without times like this to decompress I don't think I'd make it. During our break for lunch we got to talking and soon our discussion turned towards my job. I mentioned at times recently working in a school was not so fun and that in a perfect world I might have what it takes to be a fishing guide. As scary as it sounds I am not certain I'd have enough patience to let others fish while I watched. Not considering that the river might be an equally tough place to work I allowed myself to compare the two jobs as I sometimes do. Guess what, here I go again. Resting on the bank in the shade that day I think I decided fishing guide might be one of the jobs that is as tough on you mentally as teaching. Stay with me. Guides have to balance a lot of things. Maneuvering the boat among the rocks, choosing bait, bringing supplies, finding the right presentation are among the countless things affecting whether or not they are successful. 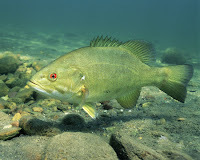 As good as they are, a guide must accept that many things beyond their control play a role in catching fish. You might be the best darn fisherman in the world and still get thwarted by some external thing. 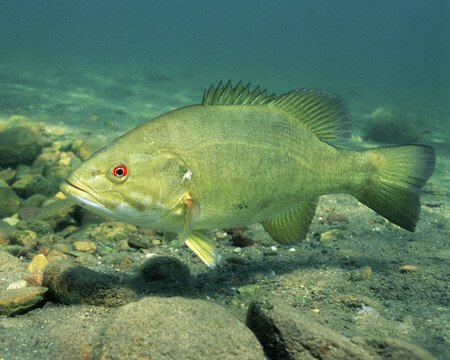 The weather, changing water conditions, and fishing pressure can derail all your efforts. Some forces working against you are so powerful and complex they defy comprehension(the recent Fish kills are as scary to me as some education reform). 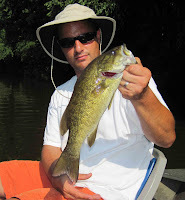 But the most important factor in catching fish is the skill of angler you are guiding. You can have all the ingredients in place. Right rod and reel, right bait, water, weather, fishing the perfect spot, with a huge bass just sitting there ready to bite. You can do everything right and it is still up to the person holding the rod to get it the fish to the boat. With a smallmouth that is never easy. So here is where guides and teachers share some things. In the case of teachers it is ultimately up to the student if they are going to be successful. Teachers, like guides, have a huge impact on their "clients". There is abundant research to support the claim that teachers can profoundly impact a child's success. No such research exists in the fishing world but it is not needed. Feedback is immediate. A good guide can make or break a trip and the quality of the experience even if the fish don't cooperate. But really great guides, like mine, don't just make a difference on that day. They equip you with skills and knowledge that will serve you well into the future and you'll use the rest of your life. They make you better. As a teacher I hope I have that same impact on my kids but after working hard, doing my best for them and trying to make them better I accept that when push comes to shove it is up to them. Sure testing provides some timely feedback but when that kid walks out your door for the last time...it's up to them. This week I took a buddy who doesn't fish as much as me out on the James. There was a boat in front of us, hitting some of the holes I knew held fish. Every bite they got was one we didn't. After about an hour and some adjustments I dialed him in on some solid fish and he did OK. I shared the satisfaction of him landing a few big ones and also the defeat when some of the bigger fish took advantage of his lack of experience. So I did OK as a guide on this day but conditions were pretty easy. We had a great time on the river. Time will tell if I made my buddy a better fisherman. At the very least I tried to impart some of what the river and my guide have taught me. I was reminded that you need knowledge, skill, some luck, and a whole lot of patience to make it as a guide and sit there while someone else catches all the fish. But perhaps more importantly you need to be willing to accept you cannot control everything. I deal with this reality both on the river and in the classroom. The idea that as good as I am it is not all up to me might be tough for some, but maybe that's part of what makes my job and my hobby so rewarding and keeps me coming back for more. Though I will admit the paycheck and the monster fish don't hurt.